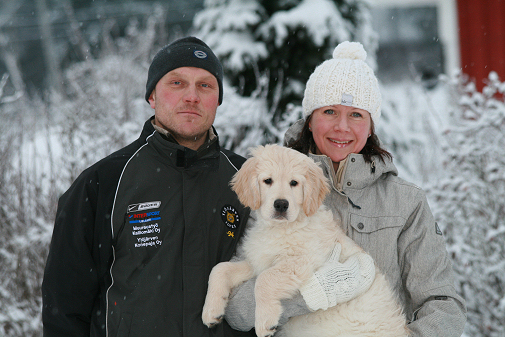 Simola family consists of myself, my husband Kari and our sons Mikko and Teemu and also 5 golden retrievers. 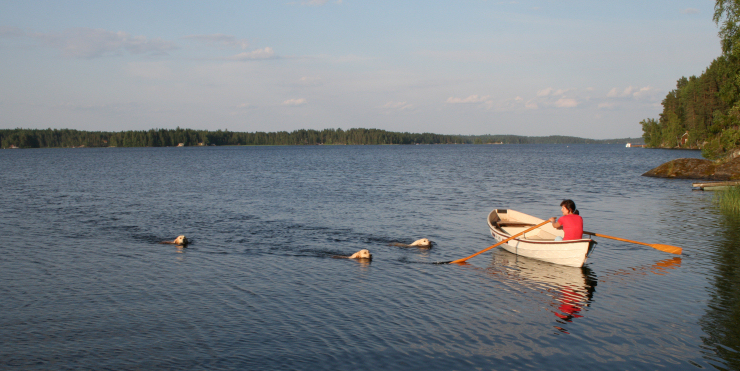 We are living in the countryside in the village of Mutala (almost 30 km drive north from Tampere), which belongs to the town Ylöjärvi. 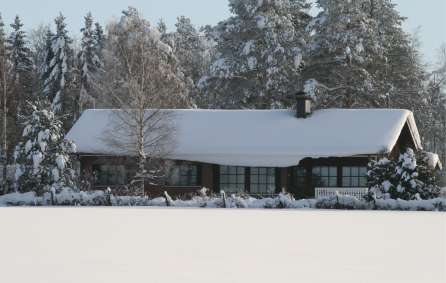 Our house stands middle of the fields, next to forests and nearest lake is 500 m away from us. 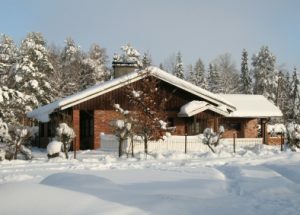 An ideal place to live with the dogs which can run free in the forests and swim in the lake during the summer. Svante-puppy moved to us from kennel Kerrien, England. 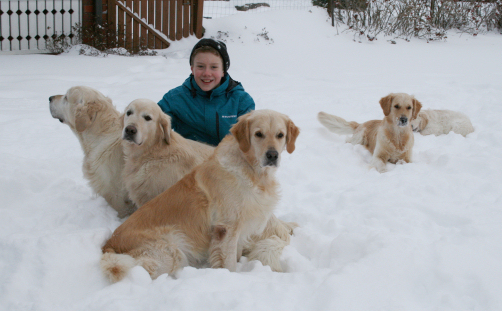 Thank you Heidi and Helena Karves and also Su Jolly of these gorgeous dogs!! Our dogs are pets of whole family but also Sari’s hobby. Sari goes mostly in the dog shows with the dogs but also trains fetching and blood tracking for qualifying field trial, not forgetting of course dogs’ own enthusiastic and joy for these hobbies. 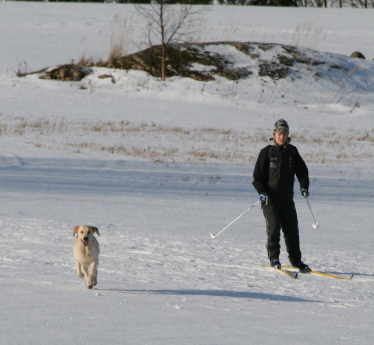 Kari takes care that dogs are in the shape by taking them for the long walks in the forest where dogs can run free. 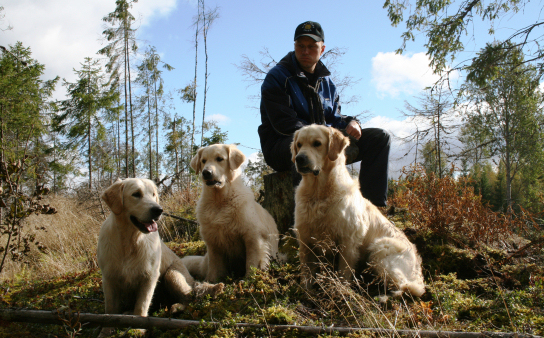 Kari has took a part with the dogs and his brother for duckhunting in autumns. 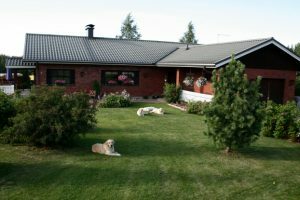 Mikko and Teemu have been great help with the dogs also. 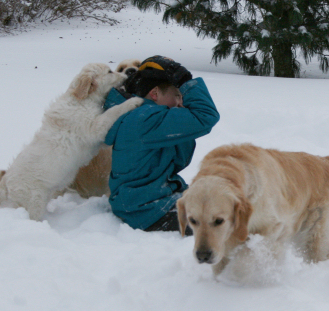 They love to play with the dogs and go with them also skiing trips etc. 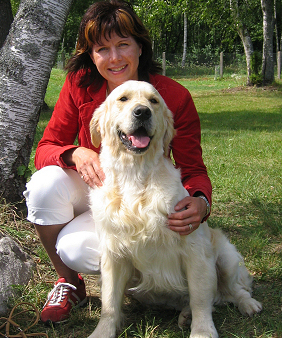 Sari has passed breeder’s course in 2009 and FCI has announced kennel name ”Simolan” in 2010.